Our Polish customer Buster Sp.j. is in the process of investigating the use of our SAERTEX LEO sandwich composite system for manufacturing parts used in the exterior panelling of rail vehicles. Producing the components with composite materials allows for weight savings of up to 50% and offers a significantly easier manufacturing process. The SAERTEX LEO system simultaneously ensures that the most stringent fire safety standards are met. The objective of the project is to investigate how components can be manufactured using the SAERTEX LEO system. The investigation is intended to both determine the usefulness and explore the different options for producing the exterior panelling of a tramcar. An upper connecting element on which monitoring systems are to be mounted was manufactured for the tramcar, along with other elements for the coupling head and roof. The primary objectives during the production of the new elements were ensuring leak tightness and facilitating easier assembly. A variety of requirements are applicable to the elements which need to be manufactured for a tramcar. On one hand, the weight must be reduced – while on the other, the overall manufacturing process should be optimised through the use of composite materials. The production of a component – in this case the panelling elements for the roof and the coupling head of the rail vehicle – should put the many possibilities offered by SAERTEX LEO to the test. Fulfilling the above-mentioned requirements in the production of tram cars is important. 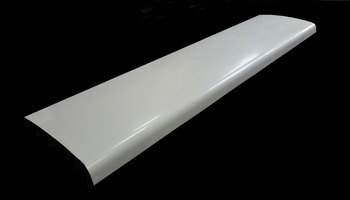 Therefore, selecting the right materials and processes is an essential step in this process. The special characteristics of SAERTEX LEO – for instance 98% lower flame propagation and 22% lower flame spread than with PES GFRP– deliver an important benefit in the rail transportation sector. 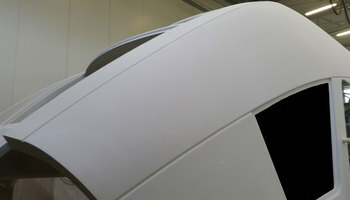 In addition to fulfilling increasingly stringent requirements regarding weight, SAERTEX LEO also exhibits excellent mechanical properties: a 40% weight savings with impressive strength and a oftentimes improved stiffness, together with tensile strength and bending characteristics that are comparable with hand lay-up laminates (HLU) and steel. Depending upon customer-specific requirements and the intended application of a component, SAERTEX LEO can be combined with various core materials, optimised fabrics and special LEO infusion resins. One disadvantage of the steel connecting elements used previously is their high weight and more complicated assembly. By selecting the appropriate SAERTEX materials and performing joint process optimisation, it was possible to fulfil the requirements of this project. In the case of the upper connecting elements of the tramcar, a weight reduction of over 30% was achieved in comparison with monolithic components that were manufactured using a hand lay-up process. 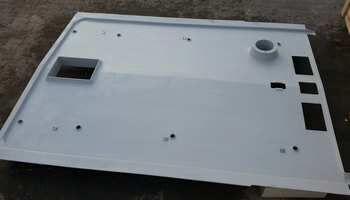 With SAERTEX LEO, it was also possible to achieve a significant weight reduction for the other roof panelling elements. In comparison with previous solutions made of steel, the weight reduction amounted to 60%. A further key benefit that became apparent during the course of the project was the simplification of the workload when assembling the components. The coupling head components were also tested with regard to their mechanical properties. The results of the strength tests carried out by Buster revealed better parameters than the tests performed on the structures used to-date with unchanged mechanical properties and a weight reduction of 40%. The components produced with the SAERTEX LEO system were manufactured using a resin infusion process. In comparison with all other manufacturing processes, the LEO system is easy to handle. The components offer highly reproducible quality together with high mechanical strength. The panelling components manufactured using this process also meet the European fire protection standard pursuant to EN 45545 Level HL2. In comparison with composite materials that are manufactured with a hand lay-up process, manufacturing the composite using SAERTEX LEO and an infusion process lead to a reduction in thickness of 50%. Overall, the project shows that the use of the SAERTEX LEO composite system delivers benefits for component manufacture – particularly in terms of mechanical properties. In summary, a positive conclusion can be drawn from the project as it has been proven possible to reduce the weight of the composite materials by almost 50% using SAERTEX LEO. Taking into consideration the identical weights of both types of composite material, the bending strength, which was increased by almost 40% with the LEO system, is three times greater than that of composites produced using the hand lay-up process and flame-retardant resins. In this project, the LEO system was produced using the LEO-R-6505 protection layer.